For the Lieutenant Governor of North Dakota, see Richard F. Larsen. Richard Ray Larsen (born June 15, 1965) is the United States Representative for Washington's 2nd congressional district and a member of the Democratic Party. He was first elected to the House of Representatives in 2000 and was re-elected in each of the eight subsequent elections, most recently in 2018. Born in Arlington, Washington, he attended Pacific Lutheran University and the University of Minnesota, earning a master's degree in public affairs. He formerly worked as director of public affairs for the Washington State Dental Association and as a lobbyist for the dental profession. Larsen, a member of the centrist New Democrat Coalition in the House, has carved an image as a moderate that appeals to crucial swing voters in the politically competitive coastal district in the northwestern corner of Washington State. He still maintains support from centers surrounding the port cities of Everett and Bellingham. Given the importance of defense- and aviation-oriented jobs in the 2nd District, Larsen's seats on the Armed Services Committee and the Transportation and Infrastructure Committee are politically advantageous. Rick Larsen has repeatedly cosponsored legislation that would create the Wild Sky Wilderness area in his home district and is a member of the Congressional Wildlife Refuge Caucus. 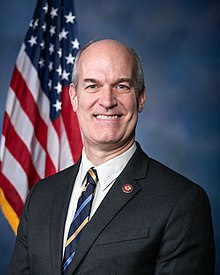 Larsen has authored a law that regulates the international marriage brokering industry, by protecting "mail order brides" from abuse and clients from being monetarily ripped off. One of Rick Larsen's major priorities is transportation issues. As a member of the House Transportation and Infrastructure Committee, he has voted yes on every transportation bill since being reelected in 2008. He believes that "sound investments in transportation keep our economy moving," and improve conditions in other areas. Representative Larsen has gotten over $52 million in the form of transportation projects for the SAFETEA-LU Bill to improve highways, increase funding for ferry systems, and expedite the flow of traffic and goods through border crossings. Since being reelected in 2008, Representative Larsen has voted yes on every labor bill, ranging from the "S-Miner Act" to the "Extending Federal Emergency Unemployment Benefits and Providing Business and Homebuyer Tax Credits" bill. Rick Larsen has shown strong support for the interests of the Utility Workers Union of America, Service Employees International Union, American Federation of State, County & Municipal Employees, and AFL – CIO. He works to support the local Washington economy by investing in small to medium-sized businesses to help them succeed in the global economy. Pro-choice interest groups have consistently supported Rick Larsen. Planned Parenthood, National Family Planning & Reproductive Health Association and NARAL Pro-Choice America have all highly rated his position on abortion. In addition, he has voted against several bills that would restrict abortion rights. Larsen has supported the House Democratic proposal for publicly funded health care. He voted for the reform bill in November 2009. Although Larsen initially voted against a bill authorizing military force in Iraq in October 2002, he has since voted yes on nearly every bill put forth in the House concerning the Iraq and Afghanistan. Larsen supported President Obama's proposed exit strategy which promises to remove combat troops by summer of 2010. Larsen defeated Republican candidate Doug Roulstone, a retired Navy officer who was recruited by GOP strategists. Larsen received 65% of the vote to Roulstone's 34%. Larsen was challenged in the Democratic primary during his 2008 reelection campaign by perennial candidate Glen Johnson. His Republican opponent for the House race was recently retired Snohomish County Sheriff Rick Bart. For the 2008 election cycle, Rick Larsen's campaign's total income was $1,336,438. His campaign spent $1,155,691. The companies that contributed the most money were Boeing Co., Microsoft Corp., American Dental Assn., McBee Strategic Consulting, and Puget Energy. The labor, finance/insurance/real estate, transportation, misc. business, and health sectors were the largest contributing sectors. The major industry donations came from health professionals, transportation unions, building trade unions, retired, and sea transport. Larsen narrowly defeated Republican nominee John Koster to win a sixth term. Larson was endorsed by the Seattle Post-Intelligencer on October 13, 2010. In 2012, Larsen won reelection by a comfortable margin, with 61% of the vote as compared to Republican Dan Matthews' 39%. 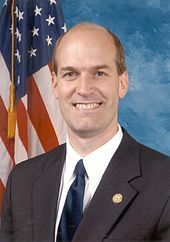 Larsen was challenged by Republican Marc Hennemann. Hennemann decided to challenge Larson after he received an answer he did not like to a question at a town hall meeting in Coupeville, WA. In the general election, Larsen gathered 64% of the vote compared to Hennemann's 36%. ^ "Membership". Congressional Arts Caucus. Retrieved March 21, 2018. ^ "Heck and Kilmer Announce Launch of Congressional Puget Sound Recovery Caucus". Congressman Derek Kilmer. Retrieved April 18, 2015. ^ Rick Larsen. "Committees and Caucuses". Retrieved February 5, 2019. ^ "Politics Home Page: Roll Call". cqpolitics.com. Archived from the original on 16 October 2007. Retrieved 18 April 2015. ^ "Wild Sky wilderness bill back in Congress". The Seattle Times. Archived from the original on May 24, 2011. Retrieved April 18, 2015. ^ a b c d "Project Vote Smart". Project Vote Smart. Retrieved April 18, 2015. ^ "Project Vote Smart". Project Vote Smart. Retrieved April 18, 2015. ^ "Project Vote Smart - Representative Rick Larsen - Interest Group Ratings". Votesmart.org. May 14, 2010. Retrieved August 29, 2010. ^ "Project Vote Smart - Representative Rick Larsen - Voting Record". Votesmart.org. July 30, 2010. Retrieved August 29, 2010. 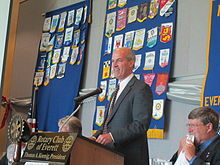 ^ "Healthcare - Rick Larsen, Representing Washington State's 2nd Congressional District". House.gov. March 23, 2010. Archived from the original on August 10, 2010. Retrieved August 29, 2010. ^ "Project Vote Smart - Representative Larsen on HR 3962 - Health Care and Insurance Law Amendments". Votesmart.org. Retrieved August 29, 2010. ^ "Project Vote Smart - Representative Rick Larsen - Voting Record". Votesmart.org. Retrieved August 29, 2010. ^ "Iraq - Rick Larsen, Representing Washington State's 2nd Congressional District". House.gov. September 11, 2001. Archived from the original on August 10, 2010. Retrieved August 29, 2010. ^ a b c d e "Project Vote Smart". Project Vote Smart. Retrieved April 18, 2015. ^ Reed, Sam. "2nd Congression District election". 2012 election results. WA STATE SEC OF STATE. ^ "He didn't like congressman's reply to his question, so now he's running against him". miamiherald. Retrieved May 3, 2018. ^ "Washington's 2nd Congressional District election, 2016 - Ballotpedia". Retrieved May 3, 2018. ^ "Washington State General Election Results". Washington Secretary of State. Retrieved May 10, 2009. ^ "Washington State General Election Results". Washington Secretary of State. Retrieved November 28, 2010.